When I was still living in Boulder (before grad school took over my life), once a week I would meet the Boulder Trail Runners for a trail tempo run. It was a pretty quick bunch, and there were a few very good regional caliber (and perhaps even national caliber...I'm really not familiar with the Who's Who of American trail running, and the good trail runners smoked me as soon as we got to a technical trail section) runners. One thing I noticed was that the most popular shoe was the La Sportiva Crosslite. At the time, I was wearing the New Balance 790, a lightweight trail racing flat that has since been replaced by the New Balance MR101, but I couldn't help but be at least a little curious about the shoe that all the fast guys and girls were wearing (peer pressure!). When I got the opportunity to try this shoe, I jumped on it! Continuing the trend of giving full reviews to shoes mentioned in this post, here's the La Sportiva Crosslite. Again, before I get down to reviewing, I'd like to apologize for the iPhone camera photos. Hopefully I'll have my computer back by the time I review my next shoe. La Sportiva's Crosslite is a minimum featured shoe engineered for the neutral or supinating runner. This low-profile trail shoe has an integrated external scree guard to protect against debris. The Crosslite has a curved shape. MEMlex EVA is a full length midsole engineered for moderate cushioning. TrailShock is located in the heel and is a dual density EVA foam designed for shock absorption and stability. Composite Shank is embedded in the midsole is a 2.5mm long shank designed for torsional stability. Scree Guard covers most of the upper and is an external guard to keep debris out of the shoe. Strobel Last is full length and is designed for comfort. FriXion AT is a full length lightweight and resilient outsole that is engineered for wear resistance. V-Groove Lugs are spaced throughout the outsole and is designed for enhanced cushioning and traction. Note: This shoe is not to be confused with the La Sportiva Crosslite 2.0, which is a stability trail racer. The 2.0 is not the "new" version of the Crosslite. They are on the market simultaneously and designed for different types of runners. The La Sportiva Crosslite doesn't have very much in the way of forefoot flexibility. Nor lateral flexibility for that matter. The first thing that I noticed upon putting on this shoe is that it's stiff and not very flexible. Maybe it's just the roadie in me and the fact that other than the NB790 (which was pretty much a road shoe that was colored brown to look like a trail shoe), it was the first and only trail shoe I've ever worn, but it just didn't feel like what I expected based on its description as a "low profile neutral lightweight shoe," as the description on the La Sportiva website states. Compared to any one of my other (admittedly road-oriented) shoes, there's not a whole lot of forefoot or lateral flexibility here. However, compared to most trail shoes, this may very well be par for the course, at least if the Brooks Ghost GTX that I just played with is any indication (the Ghost GTX is far stiffer than the regular Ghost). The La Sportiva Crosslite is a fairly firm shoe, that doesn't have a lot of soft cushioning underfoot. This part I did expect, given its pedigree as a racing flat. 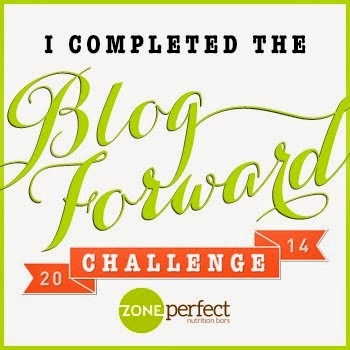 Additionally, less cushioning is necessary since trails are generally more forgiving than asphalt. It also has a fairly solid heel counter. I actually feel that due to these features and lack of lateral flexibility, not only will this shoe work for neutral runners (which is who it was designed for), but it may also work for mild to moderate overpronators, depending on when their overpronation occurs, even though it lacks any sort of posting normally used by stability shoes. 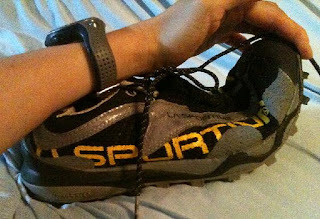 La Sportiva also makes the Crosslite 2.0, which was mentioned above. The Crosslite 2.0 is a more stable shoe specifically designed for overpronators, just in case you're a midfoot striking overpronator who finds the rearfoot control offered by the heel counter doesn't help you, or you find that the inherent stability isn't enough support. 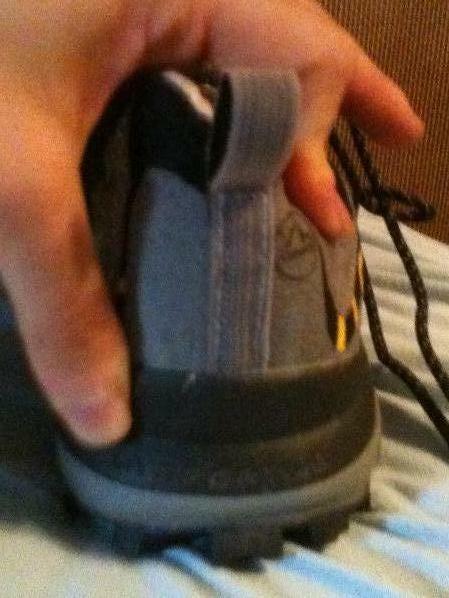 The La Sportiva Crosslite has a firm heel counter. At 10.7oz for a men's size 9, the Crosslite also doesn't feel very light for a racing flat. Again though, I may just be spoiled by road flats, since trail trainers are also significantly heavier than road trainers. I honestly don't care about weight in my training shoes, and think this is a perfectly acceptable weight for a trainer (it's actually pretty light for a general training shoe), but personally I like something a little lighter for racing. To be fair, the was introduced way before any of the new minimal trail shoes hit the market, and at the time, was actually very lightweight for a trail shoe. And I'll wager a guess that it probably has way better traction than any of the minimal trail shoes, but I can't say that for sure until I try those out. The Crosslite is built off of a pretty universally curved last, which makes sense since it seems to be designed for long trail races, and I doubt many people want a super aggressively curved last for trail marathons or ultramarathons. It also seems to have a fairly narrow forefoot. The La Sportiva Crosslite has large lugs for excellent traction in gnarly conditions. Where this shoe really shines is in bad conditions. 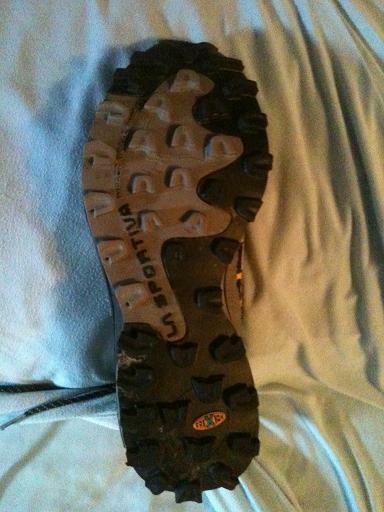 The huge lugs make it a fantastic mud or snow shoe. While there are obviously some conditions where no shoe can help you (sheets of solid ice, that gross thick clay mud, etc), it's traction is unmatched in most gnarly conditions. On muddy trail runs where every other shoe I own, including the NB790 and probably even my spikes, would send me sliding around, the Crosslite bites into the mud and keeps me on my feet. Case in point: not that long ago, two of my friends, Julie and Luke, did a crazy muddy ultra. Luke wore the Crosslite and did very well. Julie wore Vibram Five Fingers and said she did nothing but slide around in the mud. And the traction isn't limited to mud either. When the roads are slick with a mixture of slushy snow and ice and the plow hasn't come through yet (or when the plow does a bad job), the Crosslite is nearly as sure-footed as my road shoes are on pavement. While the lugs are too tall to be a smooth ride on asphalt, I'll deal with them for a run that's half-plowed and half-gnar if it means not sliding around during the gnar parts. Additionally, the Scree Guard mini-gaiter over the laces keeps snow out of my shoes. It also keeps some out some of the mud, but I don't care nearly as much about that since mud doesn't make my feet freeze the way snow does. These shoes aren't Gore-Tex, but they do a very good job of keeping my feet relatively warm and dry, or at least as dry as I could hope for in really nasty conditions, and much better than your typical mesh-filled running shoe. On the flip side, the Scree Guard makes loosening the laces impossible, and I'm not entirely sure what you'd do if you broke a lace (which I have not done). And speaking of the laces, these laces aren't very good at staying tied, and I can't even figure out how to replace them. I feel like I've done so much complaining about laces lately. Seriously, everyone should adopt the New Balance Sure Lace. Brooks just put something similar on their Pure Project...everyone else should follow suit too. The La Sportiva Crosslite has a Scree Guard to keep muck out of your shoe. You can also see the height of the lugs again in this picture. All in all, this is a very purpose-built shoe for a very specific use. If you do a lot of your running on muddy trails, or if you live somewhere where you get a lot of snow and they never plow the roads, this is your shoe, as long as you have something else for any forays you may make onto the roads. Personally, it's a little stiff for me, and I prefer my cushioning a little softer. It also doesn't really fit into my training very well, seeing as most of my running is done on the roads, and it really only gets used when the city's snowplow either does a really bad job or hasn't come through yet. However, you have to remember that I'm not really the intended audience for this shoe, and the intended audience (like my trail running buddies from Boulder) love it for its intended purpose. 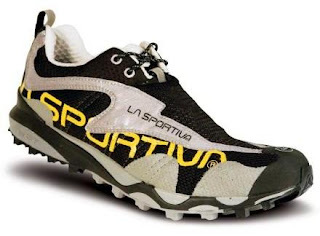 The La Sportiva Crosslite retails for $95 and retailers can be located on the La Sportiva website. It runs true to size, but sizing is based on the European scale, so you'll need to convert your size. Sizing is unisex, so women should size 1.5 sizes down before converting. As stated previously, it runs a little on the narrow side, so if you have a wider foot, you probably want to try before you buy. 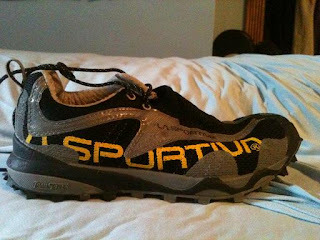 Full disclosure: I won these shoes at a race that was sponsored by La Sportiva. The opinions expressed in this view are mine and based on my experience, and do not reflect the opinions of La Sportiva or anyone else.